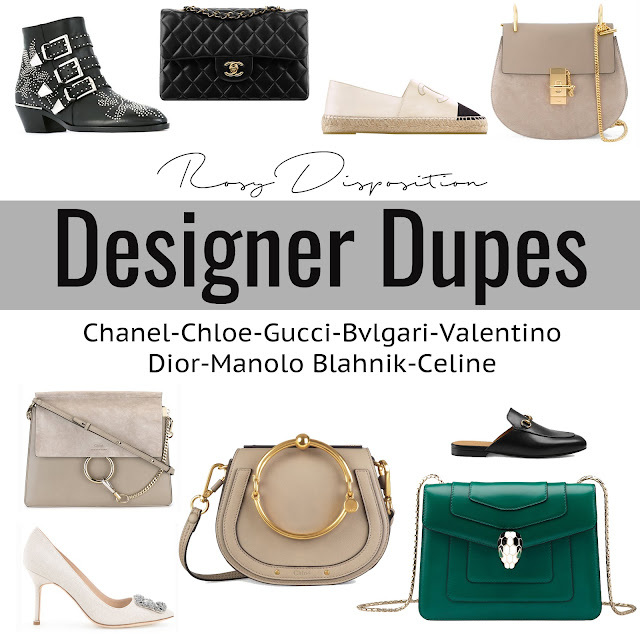 A lot of you seemed to like my designer dupes post last week and I've since found a ton more that I want to share before the dupes sell out. 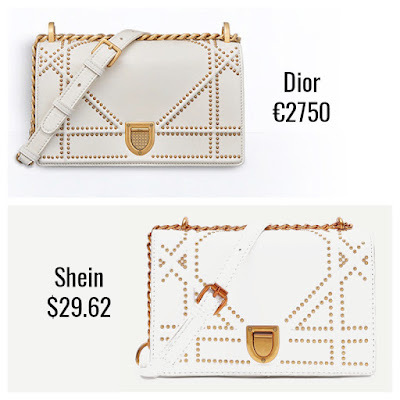 We all love getting a taste of high end fashion for less and these dupes really fit the bill. 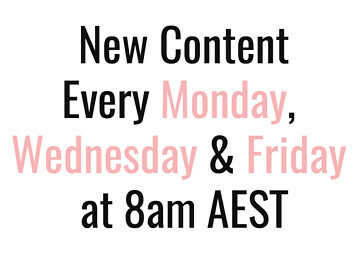 I have 12 designer bag and shoe recommendations for you so get comfy. These Gucci mules have been seriously trending lately and I'm not sure I'm into them but I do plan on trying some on. Maybe they will surprise me. 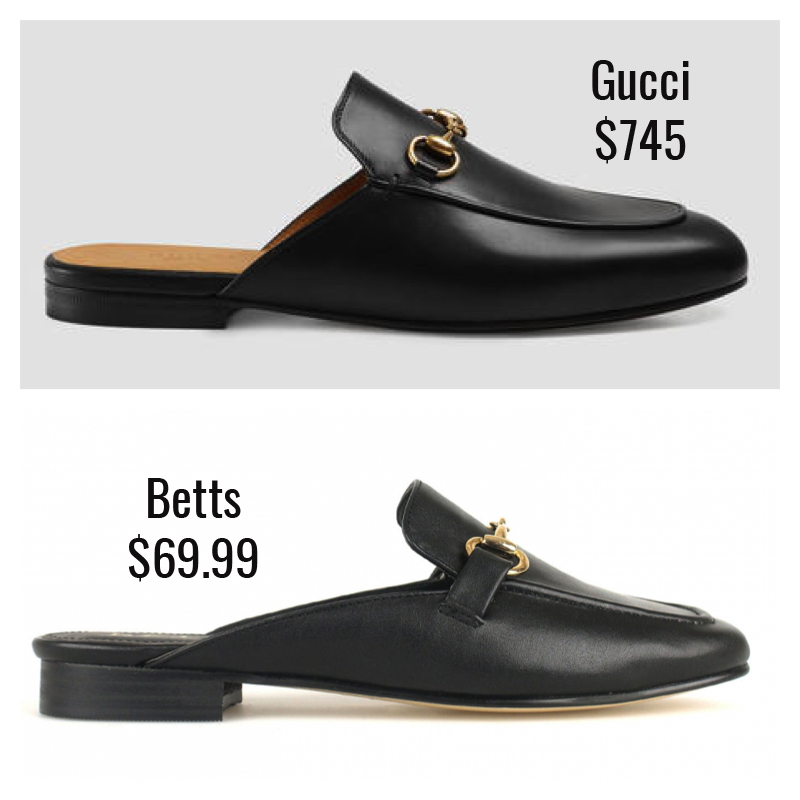 So many brands have mules inspired by Gucci but these Betts ones stood out. Betts also has some with faux fur, embroidered and unembroidered, and Boohoo has a ton of different embroidered design mules that are also so very Gucci for $30-40. While these aren't spot on, the inspiration is clear. The biggest difference is that the cross strap only crosses the toe area and joins the side of the shoe whereas the Valentino originals create a cut out between the strap and side of shoe. 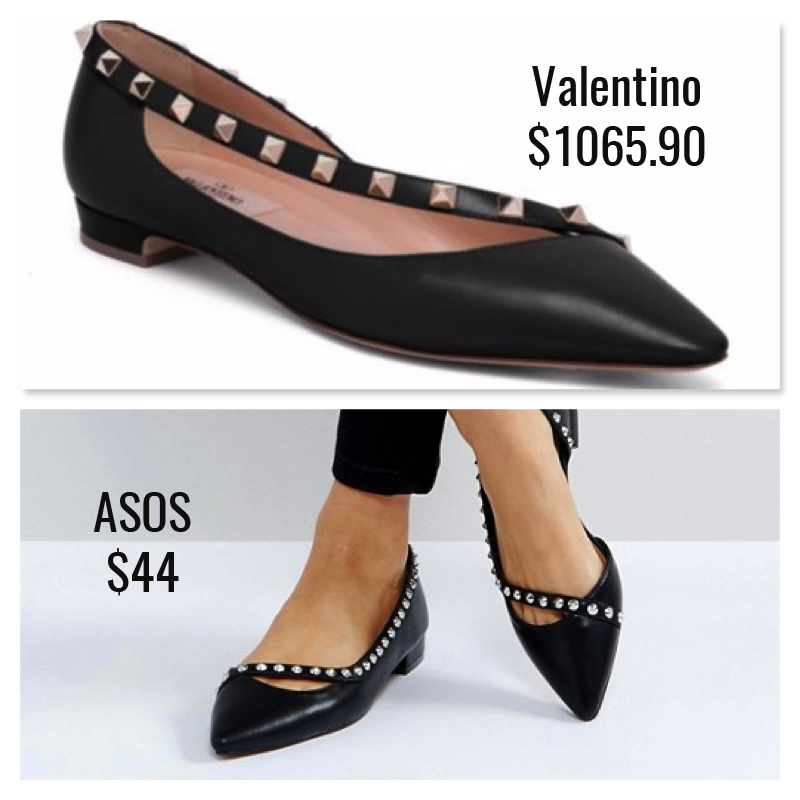 Also, the studs on the ASOS shoes are cone shaped while the Vaelntino Rockstuds are that iconic pyramid shape. At the end of the day though, it is a way to get the overall look for just 4% of the price of the originals. 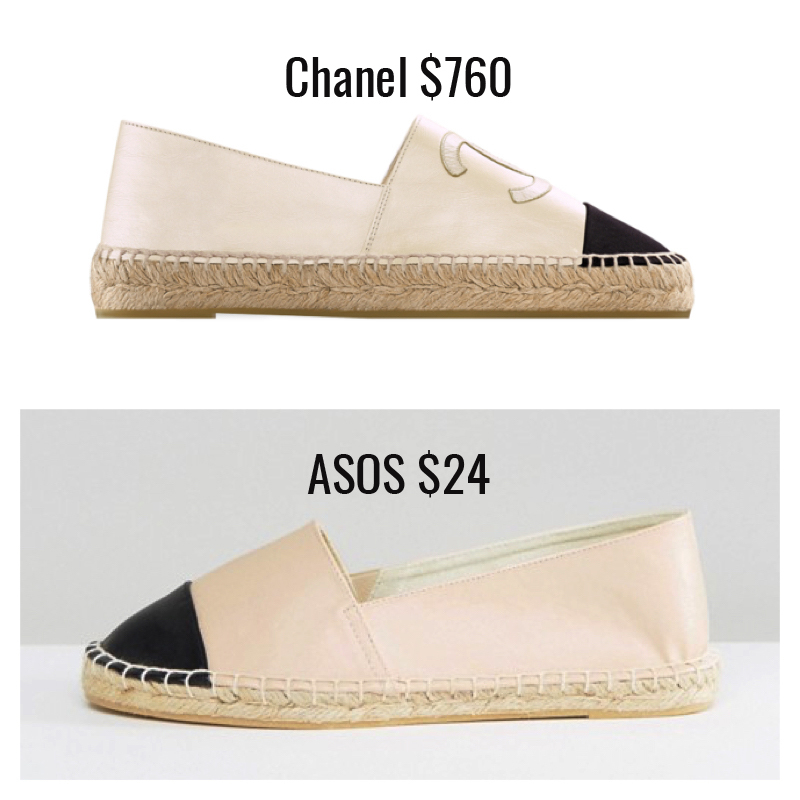 ASOS is killing it with the designer dupe shoes. These are so spot on that the only thing really missing is the CC monogram. 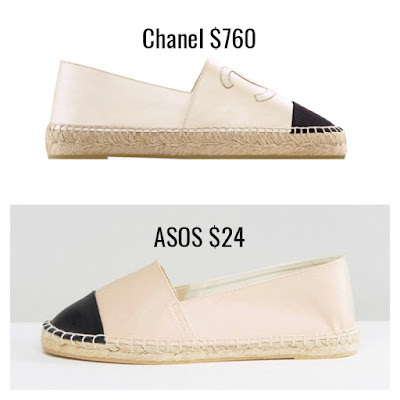 I actually really think I will buy these because I have seen so many bloggers style the Chanel espadrilles so effortlessly with jeans, floaty dresses, denim shorts and so many other effortless summer looks. As you can probably tell, I went through all 50+ pages of shoes on ASOS and found a ton of dupes. 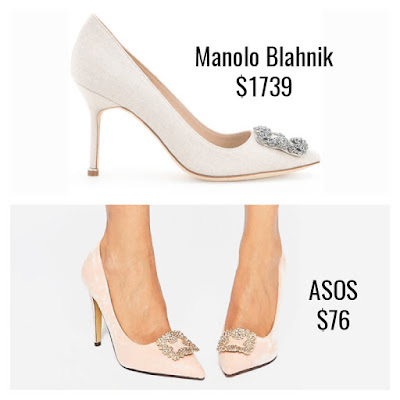 I'm a massive fan of Manolo Blahnik designs and I think they are just so elegant. I'm still on the hunt for a dupe pair of red Nadira pumps because Manolo is beyond past my price range. If you need an elegant, classy pair of pumps, you can't go past these! They would be perfect if you had some summer weddings to go to or even for the upcoming spring racing carnival. This is another very recognisable dupe! 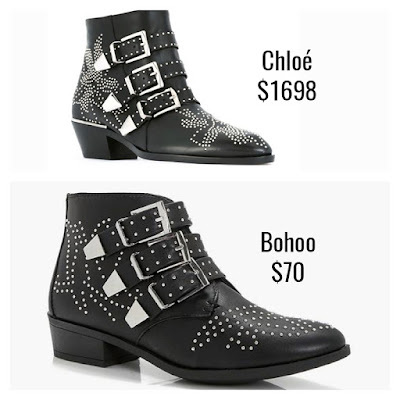 There are so many unique design features on the Chloé boots from the triple buckles to the swirling stud design, and they are all on these Boohoo boots. The Sussana boots are pretty iconic and this is a way to get them for far less. They also have a black suede finish pair here. I only wish they had ones with the gold hardware. If you don't already know, Aliexpress is kind of like an eBay of Chinese goods and has a lot of fake designer goods. I would consider this one a dupe though, not a fake, because it isn't exact and does not have any branding on it anywhere. 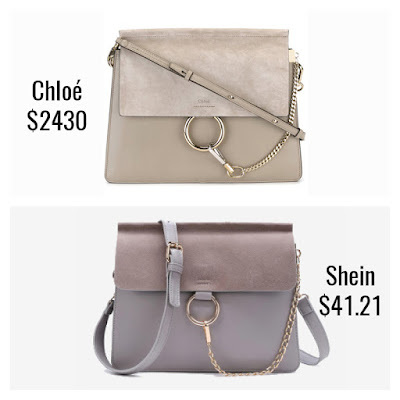 The Chloé Nile Bag is one of the hottest bags right now and I am definitely in the process of getting a dupe of my own, but I think I'm gunna splurge on a actual leather fake because I will wear it so much. This is so close and so affordable though, that I couldn't not include it. Listings from AliExpress can also disappear a lot but you should get plenty of results by searching "ring saddle bag". This is a very close dupe and the only thing separating it from being a true counterfeit fake is the absence of any branding and the flap being slightly wider on the dupe. 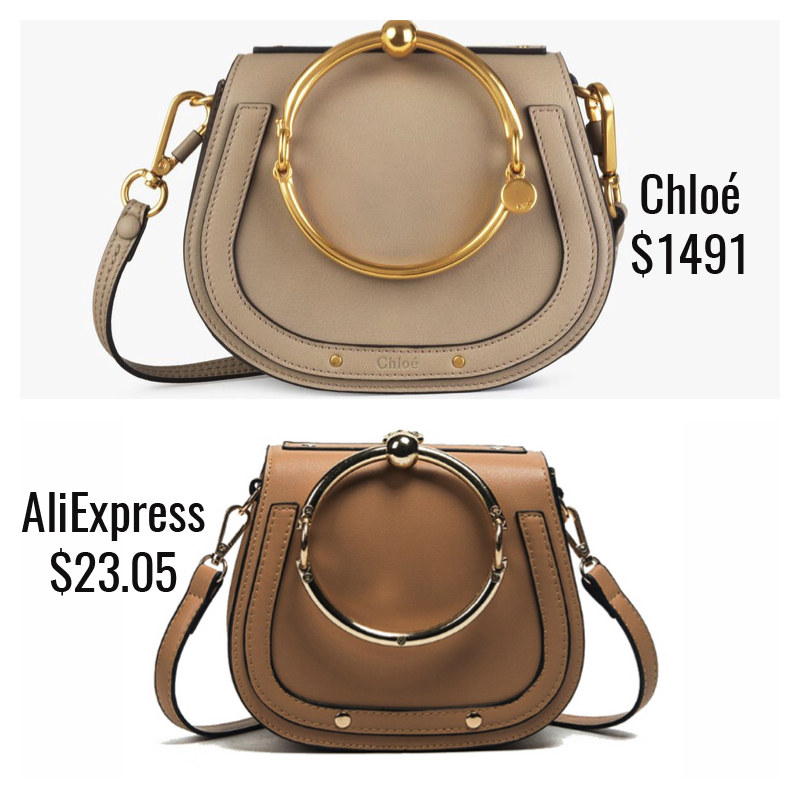 Obviously it won't be as good quality, but it is a great way to get a taste of that iconic Chloé look for less. 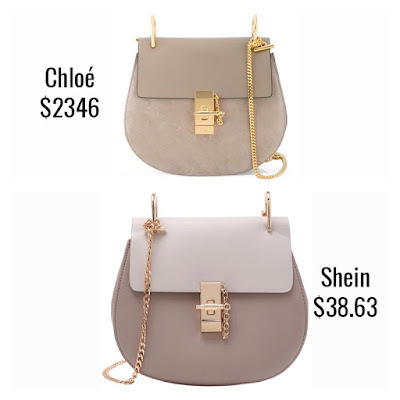 Clearly I am a little bit obsessed with Chloé bag designs at the moment which is why I managed to hunt down so many amazing dupes. As much as I love the soft pink leather version of the original, this faux suede is really pretty too. This site had a ton of other sizes, finishes and colours inspired by the Drew so just have a look through the bag section if you are after something different. This bag isn't for everyone I think, but it certainly is beautiful. 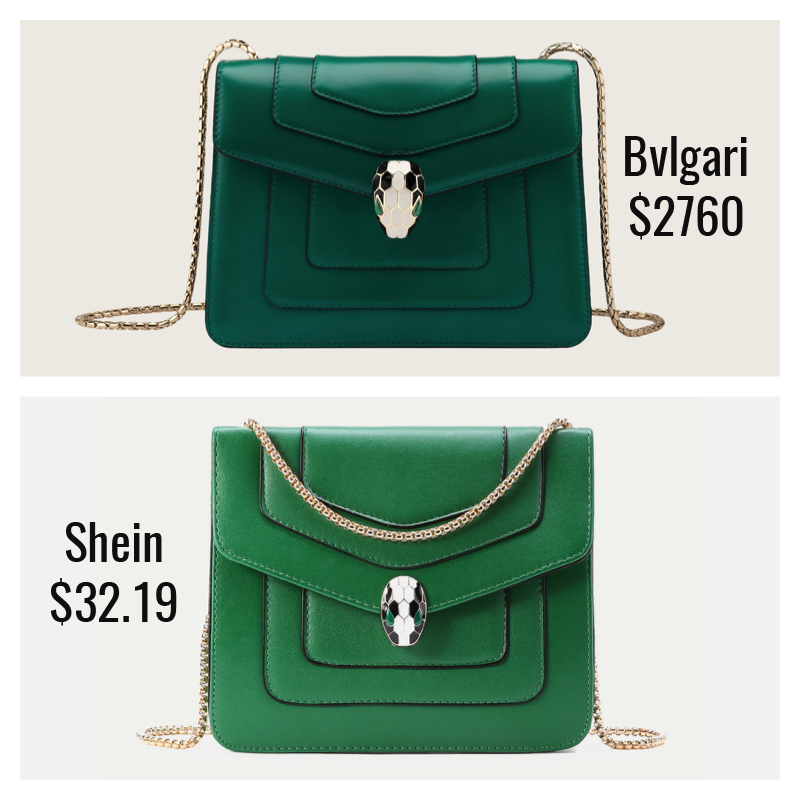 The iconic shape and that snake head clasp are so clearly Bvlgari that this bag isn't even trying to hide the clear inspiration. I think I will hold out because I want to hunt down a dupe of the white quilted Serpenti bag so stay tuned to see if I manage to track one down. This is a very distinctive design and if you are into the distressed kind of look, it might be right up your alley. 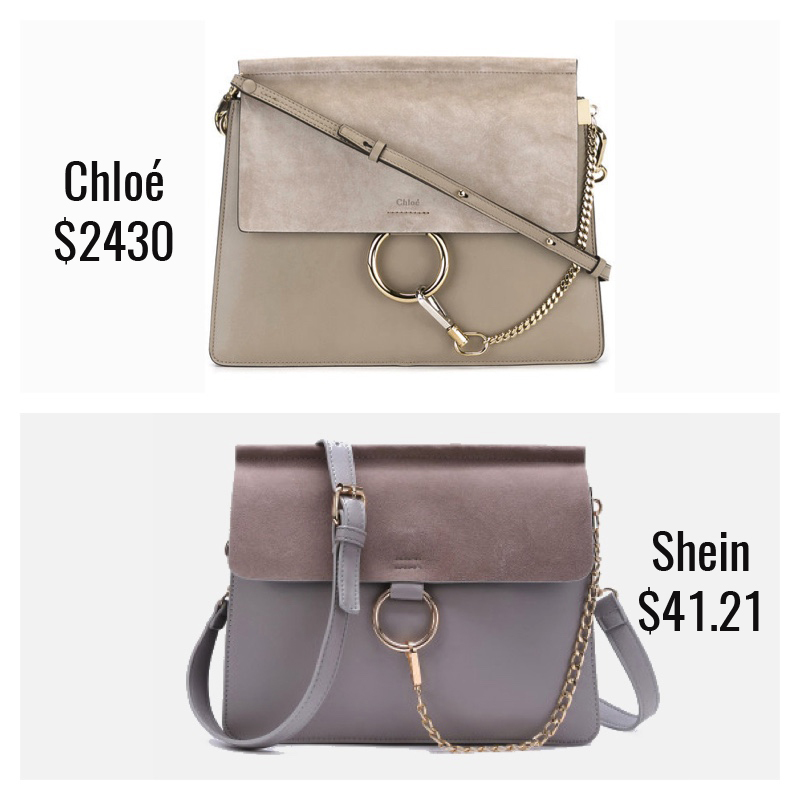 As much as we all wish we could afford a Diorama bag (I'm looking at you, classic grey), it isn't in the cards for a vast majority of us and this Shein bag is a great alternative. 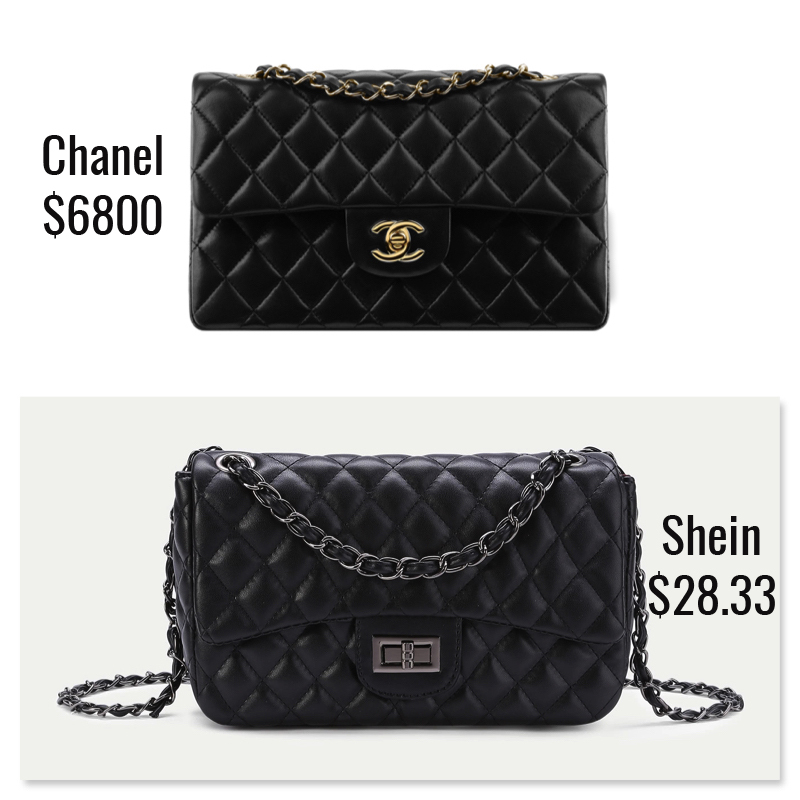 This dupe bag is a fusion of two absolutely classic Chanel flap handbags. It has the smooth quilted leather and chain of the classic flap and the clasp of the Reissue. The best part is, it will tide you over until you can afford a 6 thousand dollar bag! For me that will be about half-past never. 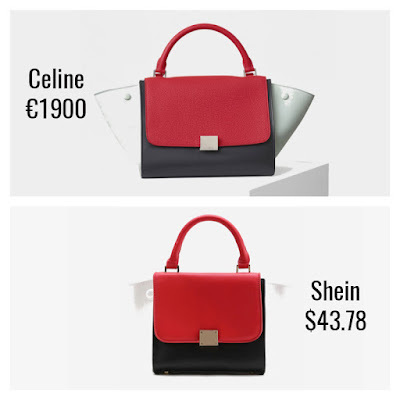 This is a pretty iconic bag and I just love the striking colour blocking. The inspiration is really clear in the Shein bag and they are extremely close in all the most defining design details. 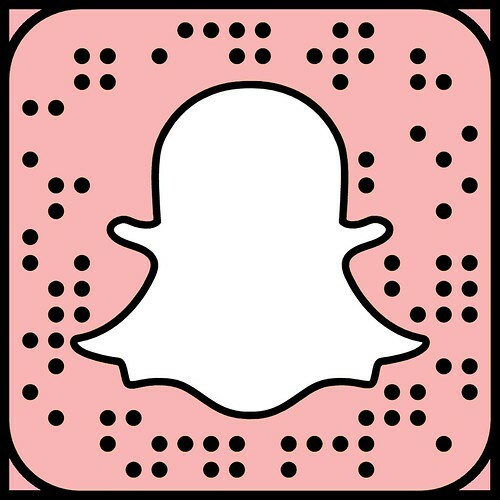 I hope you enjoy the dozen designer dupes I managed to track down for you. If you spot any designer dupes of your own or want me to hunt down a more affordable dupe of your favourite designer item, let me know in the comments below. I would also love to know if you plan on picking any of my dupes up. 13 comments on "Designer Dupes: Chanel, Chloé, Gucci, Bvlgari, Valentino, Dior, Manolo Blahnik and Celine"
Oooh awesome options! I'm really tempted by the Nile dupe as I want a saddlebag. 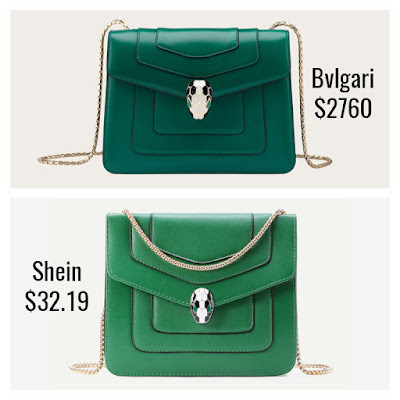 Of curiosity, where are you going to get the actual leather one? Aw thanks so much. 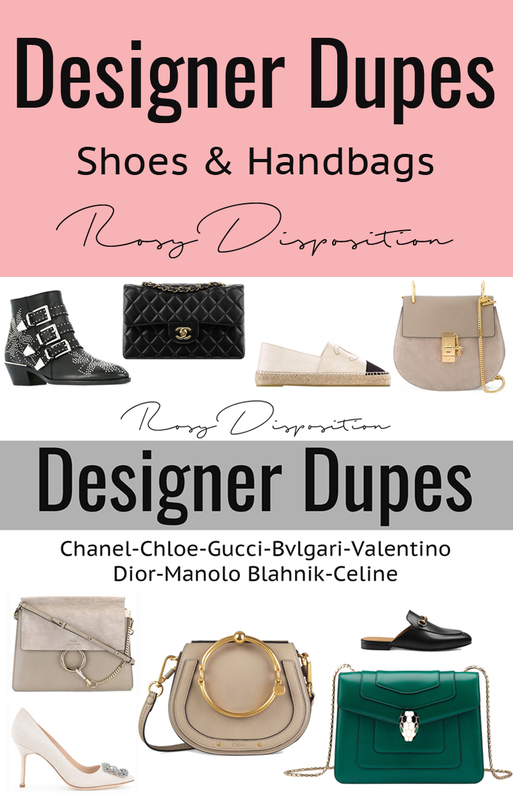 I spend a lot of time scouring the net for the best dupes. I think everyone is obsessed with the Chloé Nile bag at the moment. I know right. It's like I'm not even tempted to lust after the designer ones I can't afford. Okay, maybe that isn't true but it definitely satisfies my love affair a little bit. 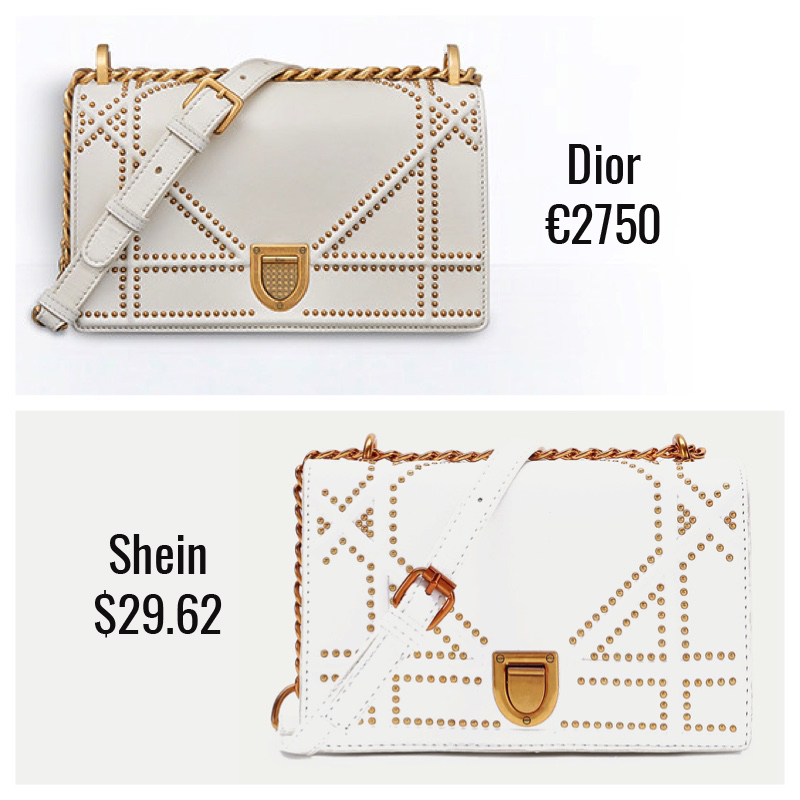 Some of this dupes are so close, you'd never tell the difference! 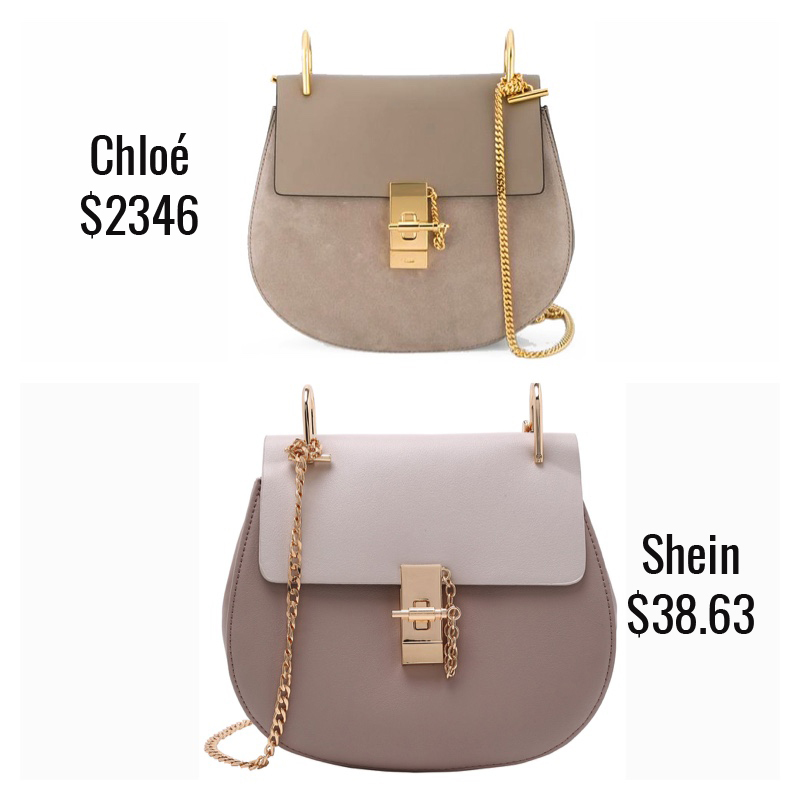 I'm loving the Chloé bags though.